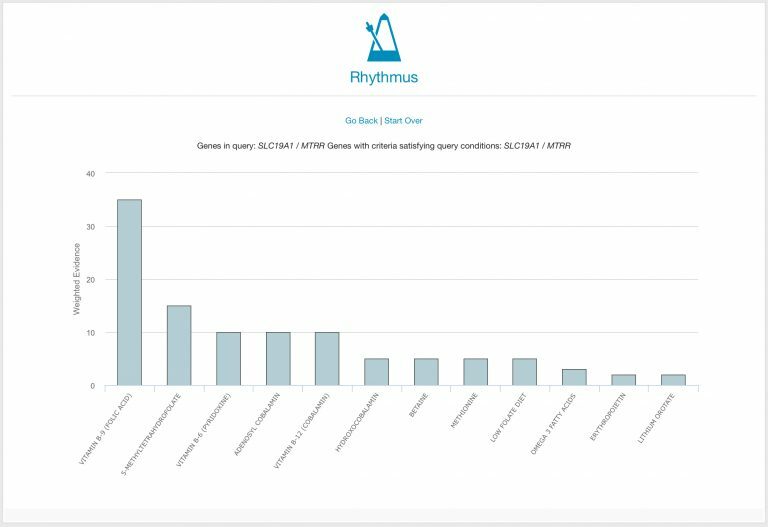 Rhythmus is a new app that makes prescribing natural agents simpler than before when using the Opus23 database of natural agent effects on genes. 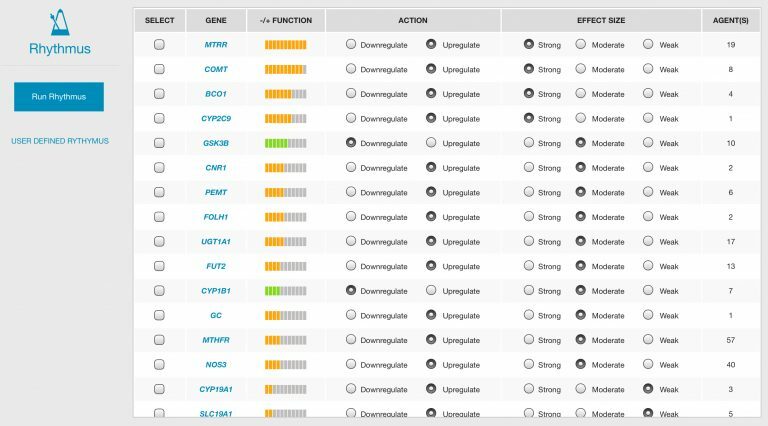 Taking an overview of all SNPs for the client, the main Rhythmus screen shows a list of genes sorted by combined SNP effect power factor, with the color scheme of orange for overall downregulated and green for overall upregulated genes. With over 7,800 individual associations of genes and natural agents in the database, all based on and hyperlinked to PubMed published studies, Opus23 makes visualisation simple for the genes with the highest editor-defined power factor and with associated natural agents that affect the gene function. Taking the Agency app one step further, Rhythmus also includes the gene visualising ability of Powerspot to help the practitioner choose the best agents for the client. The AI Pre fills the option of upregulating or downregulating the gene function and the effect required from the agents (although these can be changed manually if required). The numbers of agents associated with the gene function is also listed. Rhythmus can be used by checking some genes and other options, then click the Run Rhythmus button. The result is a network map of the genes in the query along with the natural agents that influence their function. The relative size of the agent indicates the confidence of the effect on the gene, and as with other network maps on Opus23, clicking on the gene or agent opens a popup for that element, from where it can be curated to the Client Report or the Protocol Report. The AI saves time in selecting the best options according to the available data, but this can alway be overridden by the practitioner, who may have other information about the client. Opus23 subscribes to the philosophy of ‘TMTOWTDI’ (There’s more than one way to do it, pronounced ‘Tim Toady’.) The program was designed with this idea in mind, in that it ‘doesn’t try to tell the practitioner how to parse the data.’ Rather, it presents many different frameworks and cross-sections of the available client data, using a myriad of infographic treatments. 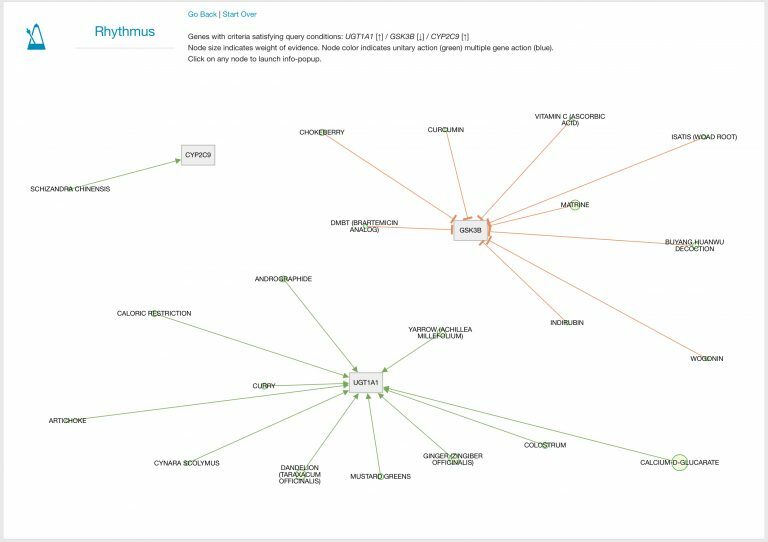 Therefore Rhythmus also offers the practitioner a user-defined alternative visualisation of up to five manually entered genes, again with an up- or downregulatory effect and the required effect size. The user-defined visualisation gives a Manhattan map of the combined effect of the possible agents, similar to one side of the Psychic app. As before, clicking on the agent opens the agent popup, where it can be curated. Rhythmus takes Opus23 to another level of utility for data mining and analysing its huge database of PubMed-based gene-agent interactions.